I got my first tattoo when I was 18. I was at the laundromat waiting for my clothes to dry and I suddenly became incredibly bored. I went for a little drive and came across my tiny town's only tattoo shop. With money to blow and time to waste I decided to get "tatted up". I hastily chose a blue and green butterfly and got it (where else?) on my ankle. It was a very nice tattoo for $15, but let's face it. I got dang lucky. Anywhere else, $15 will get you prison-quality at best. Do I regret my tattoo or the others that followed? Not really, BUT there are some things I wish and had considered before getting them. If your child is expressing interest in getting a tattoo please share this list with them. 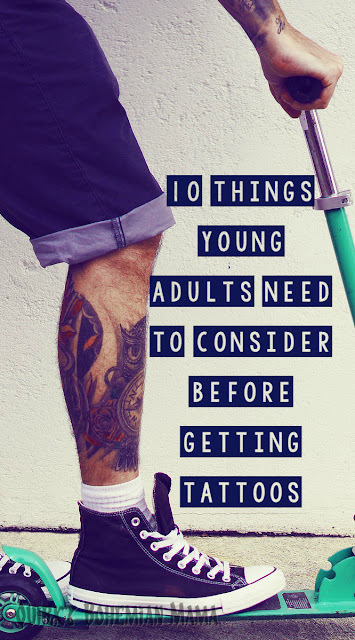 These 10 points are not just based on my experiences but those of the countless number of people who have marked themselves for life with regrettable tattoos. All tattoos hurt. It's just to what degree do they hurt. 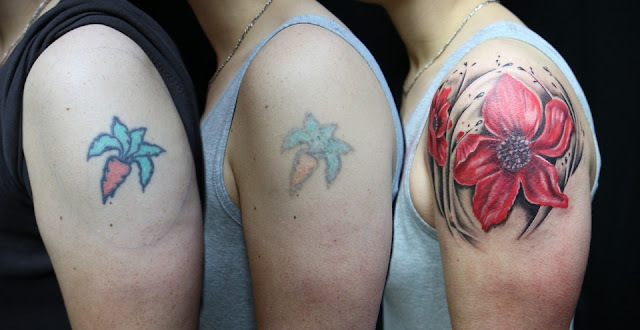 Would you rather your first experience be fifteen minutes of pain that results in a small but meaningful and amazing tattoo? Or would you rather be in three hours of pain facing the possibility that you might not even make it through the entire six hour session? Real life example: I knew a girl whose first tattoo was an elaborate lower back piece... ahem, a tramp stamp. She couldn't stand the pain and begged the artist to quit halfway through. It's been over ten years and she still cannot bring herself to have the tattoo finished. Needless to say... it looks pretty darn awful. ▲No visible tattoos if you're under 18. Some tattoo parlors allow children under 18 to be tattooed but a parent or guardian must be present. 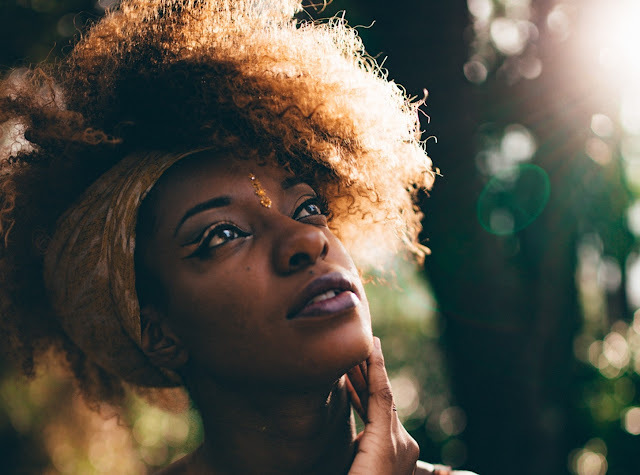 If you have decided to let your teen be tattooed, I highly advise against visible tattoos for two very simple reasons: Most public schools do not allow visible tattoos and if it turns out to be a regrettable tattoo it might not be easy to conceal. Real life example: During summer break, one of my high school classmates got a tattoo of a pit bull with enormous pendulous testicles. It was a very large, poor quality piece of art and was just enough to make a sweet young man appear to be a brainless thug. Is everyone else getting those tattoos? Is it all the rage right now? Don't get it! Be unique and be yourself. When I was at my ripe young tattooing age, "heartagram" tattoos and nautical style stars (one on the inside of each forearm or each shoulder) were all the rage. Now many people I know have had to spend hundreds of dollars getting those silly heartagrams covered and has the same stars as eeeeeveryone else. Some tattoos can be covered with clothing and some can't. 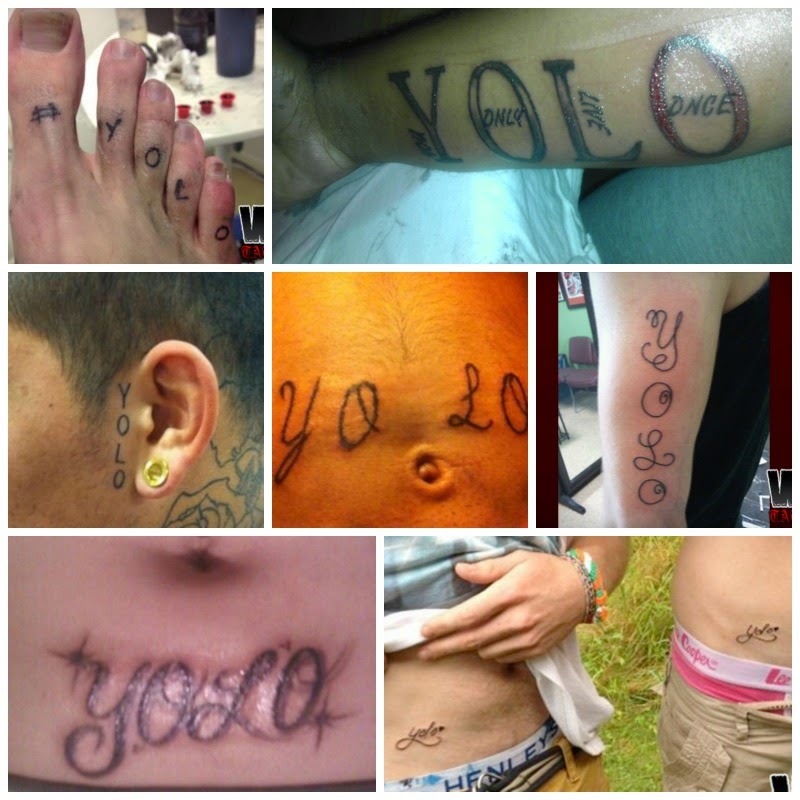 Facial, neck and hand tattoos are a big no-no for a young adult who has not yet begun his/her career. Unless you're in a very artsy and liberal town, there aren't very many places that will hire you if have highly visible tattoos that cannot be covered. Even though society is increasingly becoming more lax about the taboo of tattoos, you still have to consider that most high paying jobs will not hire you with such tattoos- no matter how qualified you are for the position. So, you were browsing Interested and came across THE perfect tattoo for yourself and you wanna get it NOW. Hold your horses Eager McBeaver! You might feel that this is the right tattoo because it's relevant to your life right now. I know it sounds lame and played out but you might just be going through a phase. If you're still obsessing over... I dunno... pirate ships in say, six months or so - then sure. Go ahead. Inks-ahoy! ▲Say NO to pop culture! Stay away from modern pop culture themed tattoos like cartoons, TV shows, movies, catchphrases, songs and books. 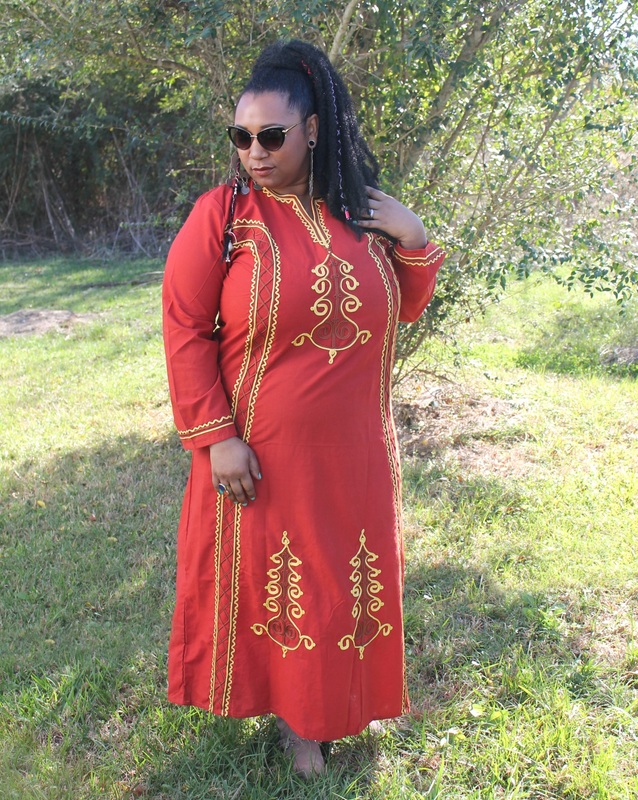 If it's been around for decades and is proven to be truly timeless, then go for it. Until then, you might want to re-consider that "Let it Go" tattoo. 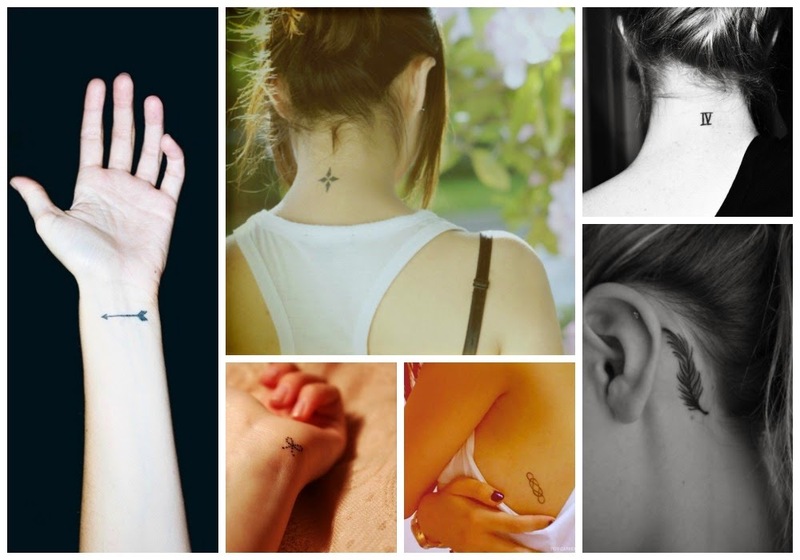 ▲Don't get matching BFF tattoos. We wish besties could truly be forever but often times during young adulthood, that's just not the case. During youth we tend to be more impressionable so opinions and beliefs can change as quickly as they are formed (especially right after high school when we're exposed to "real world"). This often leads to personal changes that can be so dramatic, it can destroy the foundation that even the most solid of friendships are built upon. If you want to express your special connection with your current best buddy, go for something less permanent, like friendship bracelets . ▲Never get a boyfriend or girlfriend's name. Be sure to ask around to see who's the best artist in town, especially if you're wanting something elaborate or hyper-realistic. Many tattoo parlors have Facebook and Instagram pages and post their portfolios there. You can go straight to the shop and see more of their work for yourself. Real life example: I would like to get a new tattoo sometime this year so I posted on Facebook asking, "Who is the best tattoo artist in town?" Within minutes, about ten people responded and 7 out of 10 recommended the same tattoo artist. A quick and effortless search just might result in the most awsomest tattoo you've ever seen! I have four tattoos. Four very unique but mediocre quality tattoos. Total cost - $185. If I had just taken the time to find the right design and the right artist, I could have put that money towards one or two very lovely pieces but I was convinced that it's not what kind of tattoos you have, it's how many you have that makes you the cool cat in town. Boy, was I wrong. Real life example. I had a friend who, for some weird reason, felt she was in competition with me to see who could get the most tattoos. She continued to get small, cheap tattoos back to back and now she looks like she's been attacked by a toddler with a Sharpie. There's no race. You've got the rest of your life to get tatted up. Take your time and put some thought into the art that will brand your forever. 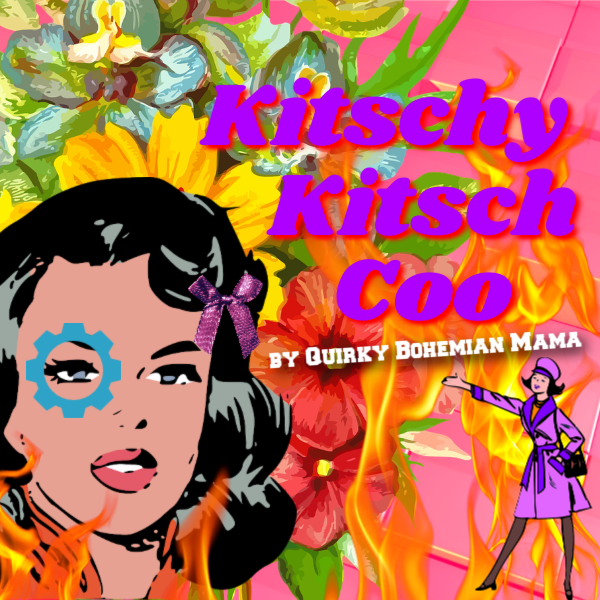 Click HERE for more of Quirky Bohemian Mama's wisdom. Hee hee! #11....don't get a large tattoo if you're an actor. You will have to spend lots of money and time buying cover up. Only real famous people get hired with ink covered arm and backs. Agreed with all of these tips. It's a permanent marking! One should consider carefully before taking the plunge!